The A clarinet is one of the most frequently used clarinets alongside the Bb model, being especially commonly played in orchestral or chamber music. If you require an A clarinet for any purpose, you can rely on Dawkes Music to provide you with an impressive variety of these instruments. An A clarinet is only a semitone lower than a Bb clarinet. An orchestral clarinettist will often carry an A clarinet with a Bb instrument, typically for the same performance, thus making a pair. Here at Dawkes Music, we can help you to choose the right A clarinet for your requirements, so that you can be sure of gaining the best results from your new instrument. What distinguishes an A clarinet from a Bb clarinet? The A clarinet doesn't have as bright a sound as the Bb. This is due to the difference in size, with the A being marginally longer and thus producing a slightly mellower, richer tone. Pitched in A, this type of clarinet is designed to give a different voice within an orchestral and soloist environment. Usually, an advancing player would try to match an A clarinet to feel comparable to their Bb instrument. It is therefore often recommended to try A clarinet models from the same brand as your Bb. How should you use an A clarinet? A clarinet of this type is especially suitable for orchestral music – particularly older European music. This instrument can frequently be heard in 19th-century orchestral and chamber music, with Johannes Brahms' Clarinet Quintet one example. When choosing an A clarinet, new or second-hand, you can use your current Bb mouthpiece and reed set-up, as it will be compatible. You may wish to modify your mouthpiece when choosing an A clarinet – for example, testing new ones to compliment the tone. However, players will usually use the same mouthpiece and reeds on Bb and A, and simply swap between them when performing. 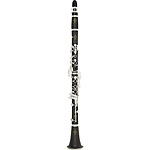 Are you looking for the perfect A clarinet for sale? We can offer you an excellent-quality A clarinet used or new when you browse our extensive selection of such instruments online right here at Dawkes Music.